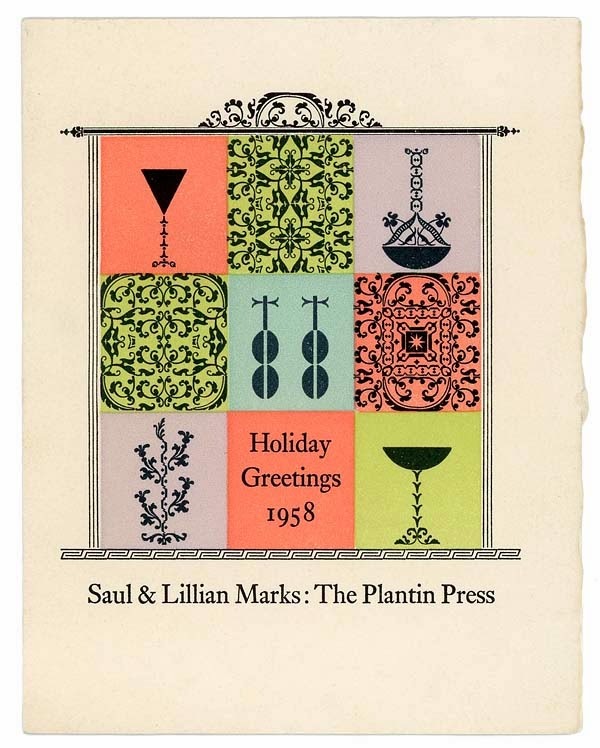 This 1958 holiday card from Saul & Lillian Marks of The Plantin Press was a recent acquisition found at the last Seattle Antiquarian Book Fair in October, and I still marvel every time I look at it. Saul Marks could manipulate type ornaments by hand, like no other, and he was a master at laying ink on paper. Saul Marks (1905-1974) began printing as an apprentice in Poland at the age of 12. He emigrated to the US in 1921, and met and married Lillian in 1928. Three years later, they moved to Los Angeles to set up their press, just as the Depression neared. Together, they maintained a small operation in order to give each book and project their personal attention, and before long, their type and press work set new standards in book production, and helped to establish Los Angleles as a center of fine press printing. When Saul died in 1974, his wife, Lillian struggled to keep the press in operation, but eventually closed it down in 1985. Together, they left an impressive legacy of fine books and ephemera that remain unequaled. From the Smithsonian collection of artist Christmas cards, comes these two typographic favorites of mine from American abstract painter, Frederick Hammersley (1919-2009). Both are silkscreen prints from the early-to-mid-1950s. 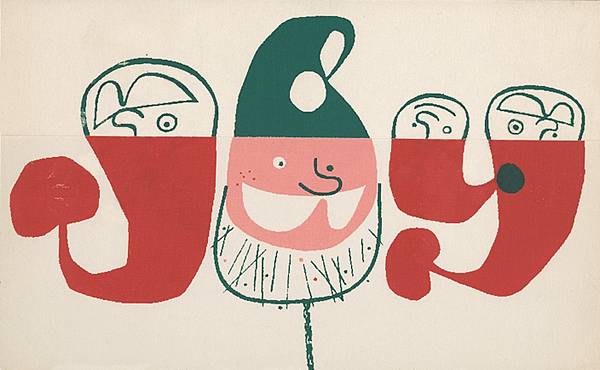 The "Joy" Card below opens at fold to reveal more of the modern santas with their red and green hats. Once again, no credit available for this holiday jewel with such beautiful typography from Art Center in Pasadena. The links here are broken (mind the link gaps please people! ), but it appears to be from the 1950s. 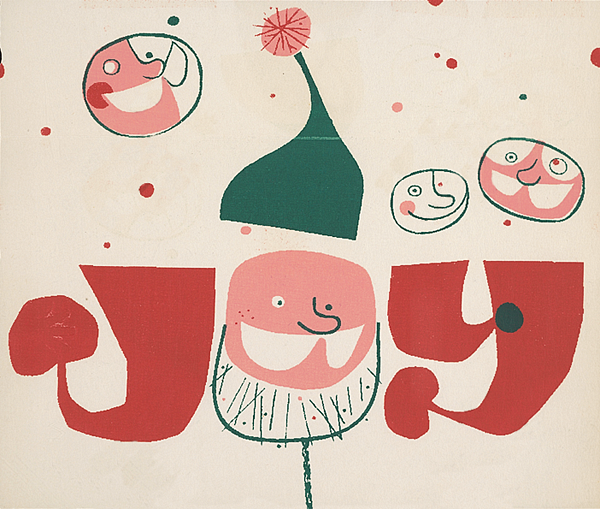 A nice arboreal display of typographic rules to set the holiday in motion. This card was composed by the Kenilworth Press in New York City and made available on Flickr, through the Herb Lubalin Study Center. 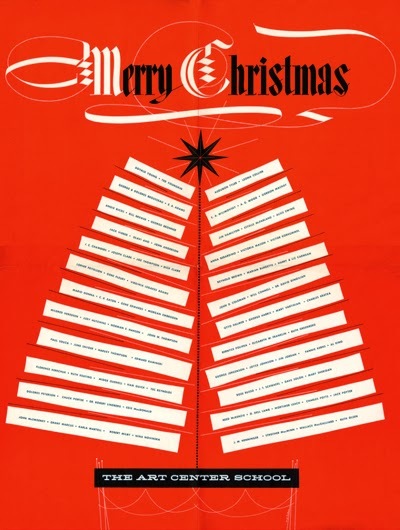 Long-time design chief at CBS, Lou Dorfsman (1918-2008), designed this elegantly simple Dorfsman Family greeting in 1953, complete with pressed fern. 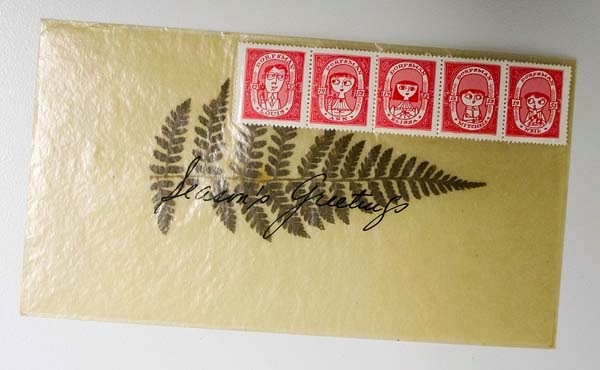 It is unconfirmed if he illustrated the stamps of family members on the glassine envelope. I would add however, that these stamps may have been the prequel to the Brady Brunch opening credits. Contributed by the Herb Lubalin Study Center. 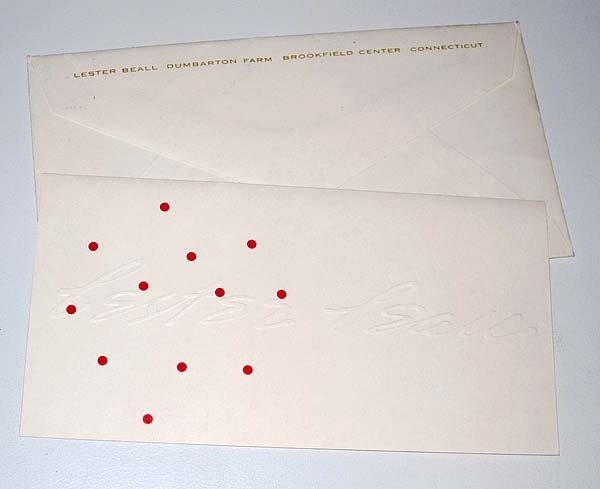 A handsomely embossed holiday greeting from Lester Beall (1903-1969) who was a pioneer of modernist design in this country. No date, but I believe it was mid-to-late 1950s, before he changed his firms name to Lester Beall Inc. Contributed by the Herb Lubalin Study Center. 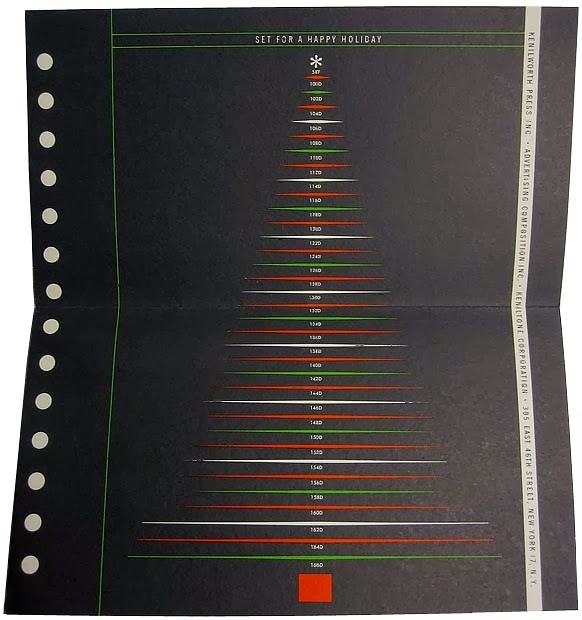 An undated Christmas greeting designed by Robert Harling (1910-2006), British designer, novelist, editor and typographer who first published Typography, in the mid-1930s together with James Shand. This influential journal of design and typography only ran for eight issues after WWII events began to take place, but it showcased the work of such designers as Jan Tschichold, Eric Gill, Herbert Bayer and E. McKnight Kauffer. Shand and Harling later went on to publish another influential journal in the mid-1940s called Alphabet and Image, which carried on their mission after Typography was discontinued. 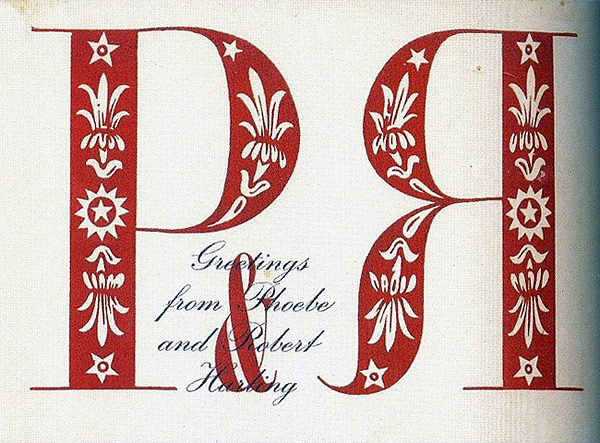 What I find so elegantly attractive about this greeting card of Harling's is the distinctive contrast between the size and weight of the decorative bold caps in relation to the small script font overlapping the ampersand. He pulled out all the stops by contrasting principles of form, structure, size, and color and weight here—an approach which Jan Tschichold aptly applied at times in some of his book work.